Dr. Martin Ling's award winning book, Muhammad: His Life Based on The Earliest Sources is widely recognized as the best biography of the Prophet in English. Allah's peace and blessing to the noble soul of the Messenger and Seal of Prophets. Kalamullah, a website which is a great repository of many Books on Islam, have shared the book's audio version. 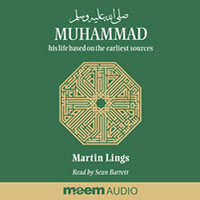 The E-Book version of Muhammad: His Life Based on The Earliest Sources is an abridged 6-hour spoken word album, read by well-known narrator Sean Barrett (famous for his TV documentary voice-overs, the BBC World Service and many other spoken word titles). We live in world with much information (and misinformation), but not much sound and useful knowledge. We live in a world with much time for media propaganda but almost no time for beneficial knowledge in real sense. For this reason, the Biography of Prophet Muhammad is of paramount importance both for Muslims and Non-Muslims. Many Muslims live their entire life in total ignorance of how really Prophet Muhammad was, what was his state of being. For them reading and revisiting his life from the Biographies of his are of great value. Martin Luther King, Jr. long time back said, "Nothing in the world is more dangerous than sincere ignorance and conscientious stupidity." And to quote a more contemporary person, the Buddhist Spiritual Leader, Dalail Lama, who said, "Where ignorance is our master, there is no possibility of real peace." Another popular spiritual teacher of the west Wayne Dyer said about ignorance is that "The highest form of ignorance is when you reject something you don't know anything about." When it comes to the central character of Islamic faith, the non-Muslims are utterly clueless and at best ignorance and in many cases very ill informed. Ignorance is the seed-bed for hatred and mistrust. For a global world where we dream of a future where all of it's citizens may co-exist and co-habitat peacefully with full respect for each other, we cannot achieve than unless we break and dissolve the barriers of ignorance about each other. And towards this step the Audio Book edition of Prophet Muhammad's biography can be a very useful instrument. Thanks to technology the audio files (can be downloaded and saved as mp3), they can easily be carried with, heard at one's own pace, can be accessed on the move or in travel. For those who have not got a chance to access or read the Book Muhammad: His Life Based on The Earliest Sources, the Audio Book offers a great alternative. In fact it can be richer since the reading is very animated. For Muslims in this month of Ramadan, this Audio Book can be of great source of inspiration to visit the time of the Beloved Messenger and to get a glimpse of his way of being. To continue the story of Arab nations, who are the descendant of Prophet Abraham's son Ishmael, the narration of the Book begins much earlier, from the Great Prophet Abraham himself, peace to his noble soul, and would enrich the world view of those who are familiar with history of Western Religion and to understand where Islam fits in the great Monotheistic currents joint by two earlier Abrahamic faiths: namely Judaism and Christianity. The Audio Book will certainly clear a lot of misconception about the character of the Prophet as it portrays his time, culture and also his very human struggles as a person who were given the extra ordinary responsibility of receiving and transmitting the Message of God as the Seal of Divine Prophets. This excellent audio book is the first of its kind and has been selected by a number of organizations as a worthy introduction to the life of Prophet Muhammad (peace & blessings of Allah be upon him). Click on the links below to access the audio files. You may right click on each link and select (Save As) to save them to your own computer for listening later. A Review of the CD via Meem Audio: Those acquainted with the book will wonder why it has taken so long for a story so graphically told, characters so roundly formed, written in language so accessible to all, to be transferred into an audio book. We have to thank Meem Audio and Sean Barrett for their endeavours and accomplishment of this. Lings' sources have been the words of men and women who heard Muhammad (may God's peace and blessings be upon him) speak and witnessed his life. He translated these works from the original Arabic, many for the first time, using his unusual gift for narrative in a style, which is fresh and direct. The reading by Sean Barrett, although it loses some of the intricate detail, as one would expect from an abridged version, is fluent, lucid and retains one's attention throughout. He begins with the story of Abraham, quoting from the Book of Genesis, and follows the fortunes of Hagar, his second wife, from the expulsion from Canaan with her son Ishmael, to the finding of Zamzam and the establishment of the holy centre in the Valley of Becca (later to become known the world over as Mecca). We are given a brief chronology of the noble ancestry of Muhammad (may God's peace and blessings be upon him), taken through his childhood to the eminent position he held as 'Al Amin' (the Trustworthy), in Meccan society before receiving Prophethood. The trials and tribulations of the early Meccan period followed by the triumphs of the first Islamic state in Medina are told in a manner, which engage the emotions of the listener. The work ends recounting the death of the 'beloved of God' in Medina. Sean Barrett reads with good pronunciation of Arabic. The tone and tempo vary appropriately with the different events being told, giving a sense of urgency at times such as battles and comfortable wellbeing at others. The story is easy to follow partly because of Barrett's clear voice but mostly because of the simplicity of the narrative. It comes as no surprise that the author approved the abridgement, which remains true to the story.